One of our closest galactic neighbors shows its awesome beauty in this new image from NASA's Spitzer Space Telescope. 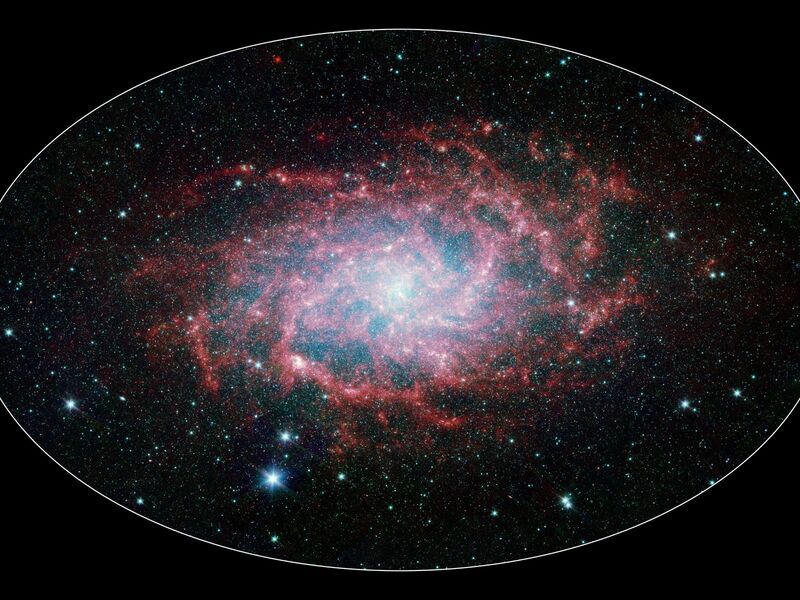 M33, also known as the Triangulum Galaxy, is a member of what's known as our Local Group of galaxies. Along with our own Milky Way, this group travels together in the universe, as they are gravitationally bound. 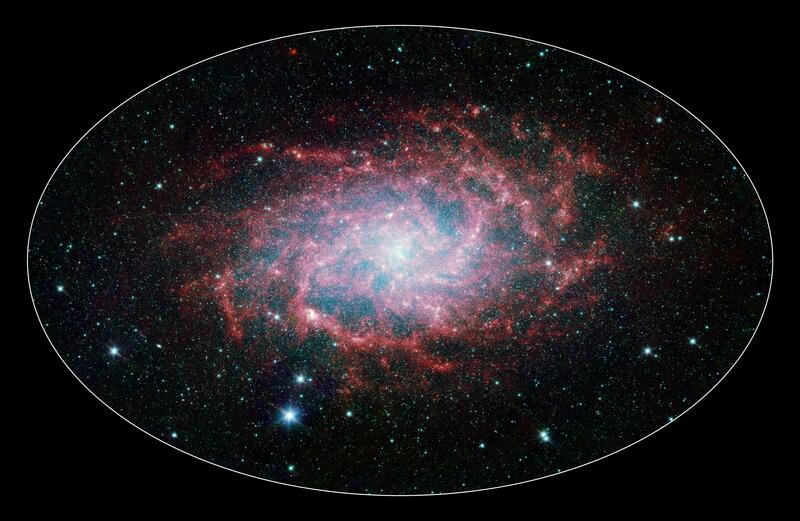 In fact, M33 is one of the few galaxies that is moving toward the Milky Way despite the fact that space itself is expanding, causing most galaxies in the universe to grow farther and farther apart. When viewed with Spitzer's infrared eyes, this elegant spiral galaxy sparkles with color and detail. Stars appear as glistening blue gems (many of which are actually foreground stars in our own galaxy), while dust in the spiral disk of the galaxy glows pink and red. But not only is this new image beautiful, it also shows M33 to be surprising large—bigger than its visible-light appearance would suggest. With its ability to detect cold, dark dust, Spitzer can see emission from cooler material well beyond the visible range of M33's disk. Exactly how this cold material moved outward from the galaxy is still a mystery, but winds from giant stars or supernovas may be responsible. 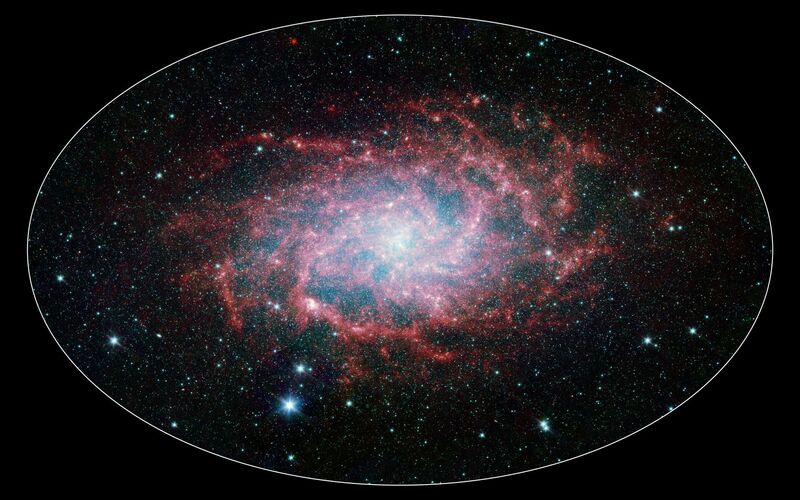 M33 is located about 2.9 million light-years away in the constellation Triangulum. 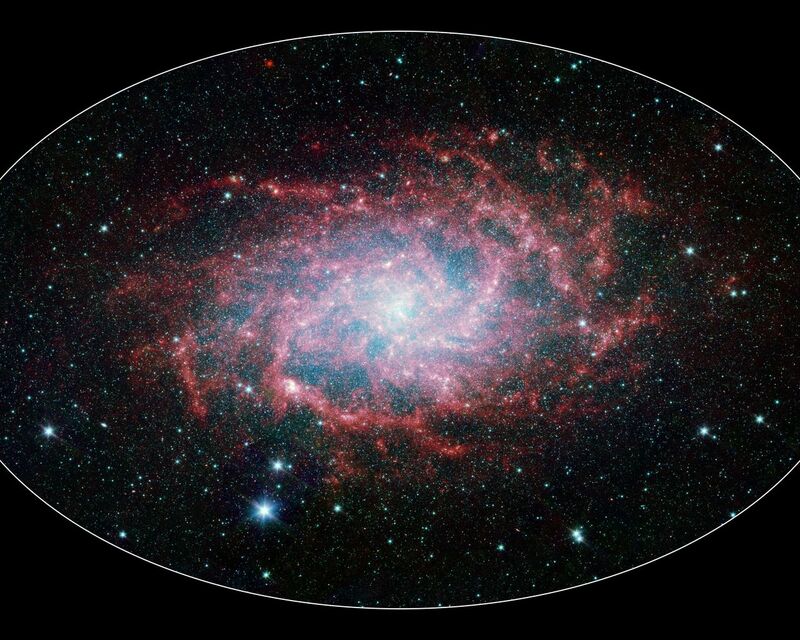 This composite image was taken by Spitzer's infrared array camera. The color blue indicates infrared light of 3.6 microns, green shows 4.5-micron light, and red 8.0 microns.